I can remenber Ian Brown and Ian Greenfield giving me a cheer in the Ardennes on the last stge of the 1956 Tour of Europe, Longuyon to Namur. It was really nice to see them, all the reast of the Brits had been eliminated, mainly by the 10% time limit, 5% on the short stage of km. I had been on my own fot the last 5 stages. 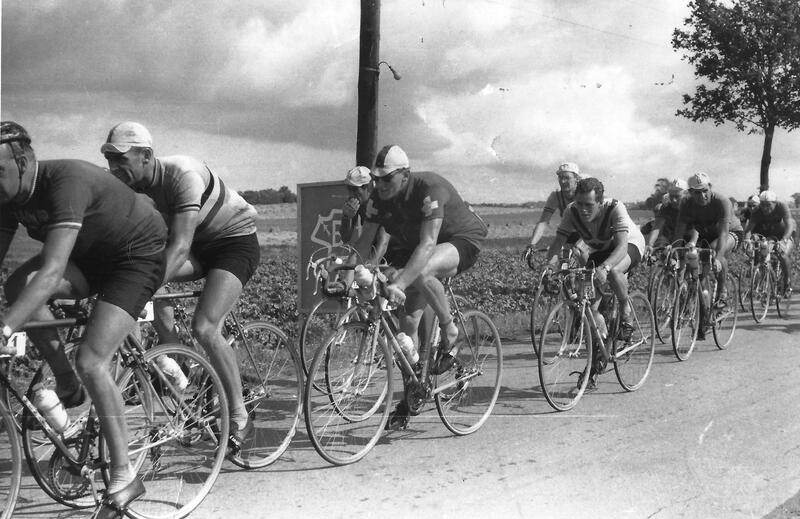 It was not a Tour in a strict definition, it was an across Europe race. It started in Zagreb and the went nearly straight across To Italy, Austria, Germany, France and the the Citadel at Namur. Roger Riviere was 1st Adolf Christianson from Austria was 3rd. He finished 3rd in the T de F the next year riding as a guest of Switzerland. Hi Frank, good to hear from you. Ah, Ian Brown, I should have known him. I didn’t know Ken Mitchell was in the Willesden (I was on their club run last Sunday). Any idea of the year Frank? If I can lose 10kg I should be in peak form for May! I think the year would be 55 or 56, the jersies are a bit of a givaway. They were NCU jersies and I think they will have got rid of them by end of 55 certainly by end of 56. There would have an amateur race on the Sat. People like Stan Brittain, Harry Reynolds Bill Holmes would be the ones with the info. Hope you manage to shed some of your 10kg, but it is big ask by May. Sorry to learn that you are, at long last, showing your age! The picture is from the Worlds 1956 i Ballerup, Denmark. See the route map on the lamp post.